As with all fine wine, to keep it in optimum condition all Vintage Port should be stored lying down in order to keep the cork moist. Vintage Port bottles have white splash of paint on one side which should be always kept uppermost when laying down the bottle. Vintage Port, like all fine wines, prefers to remain undisturbed, lying on its side in a dark and at least slightly humid place at a stable temperature of between 10Â°C and 14Â°C to mature properly. With a little care, wine can be stored at home, or you can store it in specialist cellars. Storing at Home With a little care, wine can be stored at home, or you can store it in specialist cellars. When assessing your home for a suitable site for storing Vintage Port or any fine wine these should be your considerations: A dark place â€“ light is an enemy. The temperature should be be constant, and certainly not subject to sudden or extreme changes of temperature. Constancy is more important than the actual degree reading, though you do want to choose a cool place, 15Â°C or less. Humidity should not be an issue unless it is very dry. How Long Can I Store my Port For? Unopened, Port is designed to last a very long time, much longer than table wine. Port, has lots of sugar and more alcohol than dry table wine. Both ingredients help shield the wine against the ravages of time (unfortunnately this does not work for humans). Most sealed ports will survive well for decades after bottling. Only Vintage Ports will improve with age. Others such as tawny, ruby and late-bottled vintage ports, the most popular styles, typically do not mature in bottle. Vintage Ports are bottled with their unfiltered sediment, which helps them evolve and yield prized secondary and tertiary nuances. They are designed to last decades and will be at their peak only after about two decades. 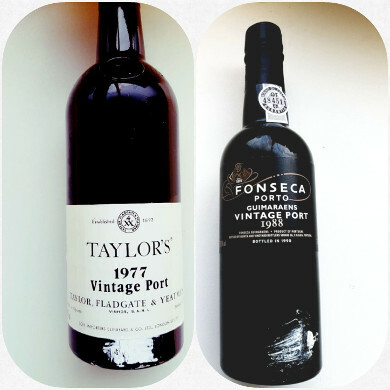 Vintage Port did not legally have to be labelled for sale until it became law with the 1977 Port vintage, so there was often no label to see which way up the bottle was (the vintage and name of the Port would be on the capsule and the cork). Therefore, if the bottle was left one one side the sediment will all collect on one side. Sometimes it is a neat blob of white paint on a vintage Port bottle, other times it is a real splash â€“ and it seems to vary from Port house to Port House and, no doubt, depends who was working in the cellar on particular day.